This is my second attempt to build one of Nelson's audio art design circuits. I started with the famous Zen Line Stage, and I thought it would improve the sound of my system. It really did! So the next step would be logically the power amps. That's what I started. Months have passed, and now I've just finished one. It worked well the second time I tried it, had reversed the C and E pins of the two ZTX 450...Oops! But no worry, nothing broke... It is a technical choice that no one could blame, I decided to go on for 2 mono-blocks from the original stereo A4 from Nelson. Three reasons for this: really separate power supplies, get enough heatsinking for this little monster and shorten the speakers cable, in order to do a passive bi-wire later. Nelson would certainly not criticize those options... So I started working. As you can see, the design is the same than my ZLS, with chassis made by hand, carefully and this will last. 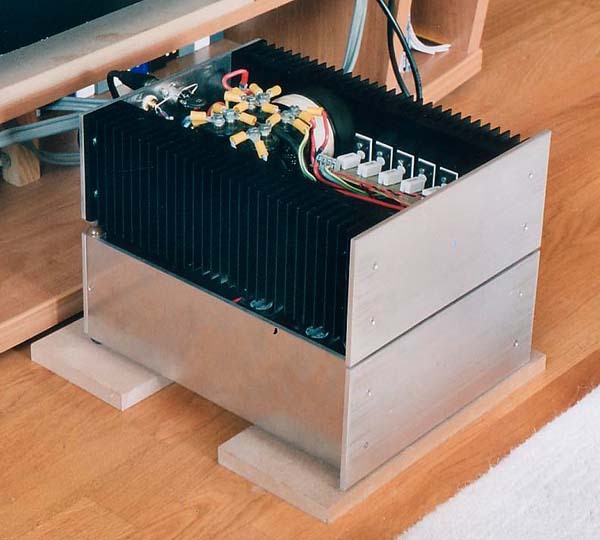 I don't like the cheap "commercial boxes" everyone can find on the local electronic shop...All part of chassis are made with thick aluminum, giving less magnetical problems, thus enhancing sound quality, as were the Amplifier series from Nelson. This mono-block is made of two identical chassis: one for the power supply, and one for the two gain stage amp. I so have 2 heatsinks, one for the active current source and one for the output stage. As you can see on the photos, This is quite full and small (256 x220 x 300).In this way I don't pick up noise from the toroid, which can be a solid, but cheap one. All starts here with a 500VA 2X 40V,then 2 diode bridges and 2X 47mF.Then I have a 4 pin XLR to the upper chassis, where is implemented a Pi filter 10mF/4,7mH/10mF on each polarity of the PSU. At the right you can see the little thermostatic switch. The output noise is greatly reduced this way, towards inaudible hum from the speaker. As the temp of the amp was a little too high in my opinion, I settled a 12V low noise fan from PAPST under the amp chassis, so the air is forced onto the external part of heatsinks. I went from 65 Celsius to 55, which is a good security precaution. The amp needed a little period to give the best of himself. I used IRFP240 matched within 20mV.The 2 IRF9610 are matched within 2 mV, and thermally linked together. All internal wire (PSU,HP,GND) is a 2,5mm square rigid copper single wire. In fact, it's cheaper and results are better, to my opinion, than exotic speaker cable, considering the short sections I had to make. Subjective listening opinion: For me the A4 from Pass Labs brings a totally new dimension in power amplification, compared to what I was used to listen to before. I have heard some high power packs, some push-pull designs, class A, class AB, tube designs, push-pull pentodes, single ended triodes, 300B push-pull, and other commercially available power amps, integrated or not. Unfortunately listening conditions in Paris auditoriums are far from domestic, and are sometimes a disaster. Add to this the actual tendency to bad efficiency loudspeakers, which I believe is not a right choice for judging sound quality of a power amp. So most of vendors go on for a little cable change, and anyone could be disoriented, or disappointed. 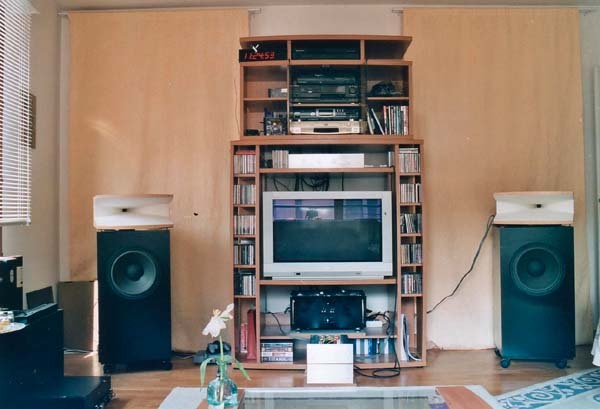 A long time ago I had a Sony integrated, budget price, and some nice CELESTION Ditton Bahamas. I was a student...I needed more. I went recently for a new system, high efficiency with a PR330 M0 from Audax in Bass-reflex, and a 1" compression driver DE25 from B and C modified, with some GUIGUE sanded-wood horns. The filter is entirely passive, 24dB/oct. 500Hz and is mostly close to a phase linear one. The global sensitivity is 97 dB/W after response equalization of the 1" driver. 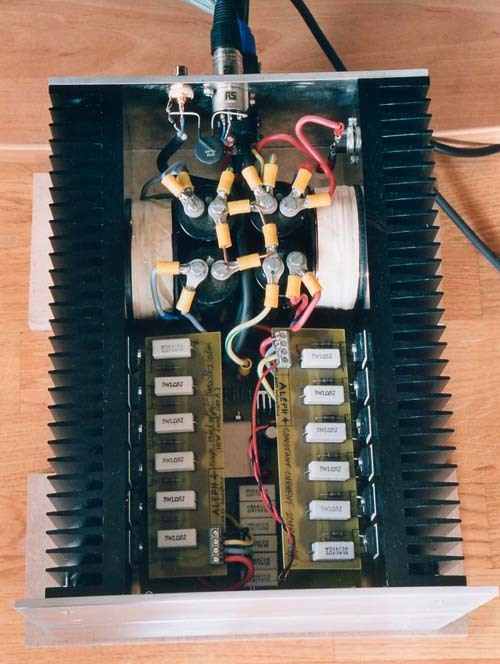 I had a class A amp from Elektor, home made, and a M.F. preamp. I was quite happy, but I thought it would be possible to forward. Listening to concerts often, I could imagine which direction take to ...improve again. But how?...The next step went from...Pass Labs. I discovered the site, the projects, the articles and I started to seriously download stuff to think about it. And it was reflection time...One thing was pretty obvious for me: logically, the less elements, in the amps, the better they should sound! But with a good design, more difficult to achieve. But Nelson seemed so sure. His technical choices seemed perfectly justified. And for the sound, all the gallery builders looked so happy...That should be true. I should try and judge by myself. That's what I did. I built the Zen Line Stage, balanced version. It is a single stage single ended Mosfet class A. It is really simple, and made a dramatic improvement, sonically. You can see it in the gallery. I was persuaded that Nelson held the key. I should try one of his amps. And bite music! I chose the A4. This design was unknown for me, but interesting. And 2 gain stages... only... In my opinion it's an incredible sounding power amp. It doesn't sound like an amp, whatever tube or transistor design. I seem to be plugged into a world of equilibrium tonal characteristics, of defined sound to the limits of delicate, with warm waves giving place to so fast attacks. There is no treble, no medium existence, they can't be picked up and be analyzed separately. The entire audio spectrum is very wide, with no accentuation in any register. This amp really knows about bass. It is sweet, explosive and muscled at the same time. It is extended and always controlled. It really serves like a base for all other frequencies, to upper highs. All registers are integrated, without any harshness in the treble region. My ears "feel" that this amp works the same way as sound travels in air. The attacks are so fast, like listening to a concert outside, but...we can hear the microphones' respective sound, that's really something! Every studio trick is more obvious too, like ambiences on voices superposed with the microphone's acoustic signature, and virtual distance...This amp proves that much remains to be done in this domain...The amp seems virtually to have no power limits. Over those 97 dB/Watt/1m speakers, this is not a surprise!!! I really think Nelson is like PICASSO, both create masterpieces with just a single pencil stroke... I have more fun listening to music, my life is changed, I'm a musician so...all this must be true!! Why wouldn't you try, and eventually sell your old M.L. (not so natural, and too expensive!!!!!) I can tell you, it is really a great adventure!!!... Best regards ar PS Great thanks to Nelson for his e-mail contributions to "pass" the construction...!!! I would like to thank my friend Hughes Borsarello for support, patience and tech helps to my questions!